We checked out Saud beach then took a dip on the water first while waiting for our breakfast to be served. We just stayed near the shore because the sea current was strong. But it was still fun playing with the waves. Since we have a time to catch for our tour, we didn’t spend longer on the beach. We went back to our lodge which is just right in time for our breakfast. As soon as we finished our foods, we went back to our room and made ourselves ready for the tour. Mang Arnel fetched us at 9:00 AM then moved on to our first destination. 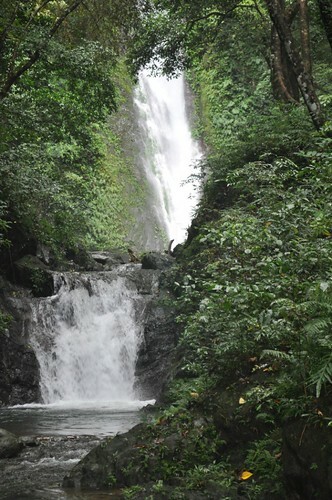 Our first destination, Kabigan Falls. We paid PHP 10.00 for the entrance fee and PHP 100.00 for the guide. Afterwards, we started the trek. 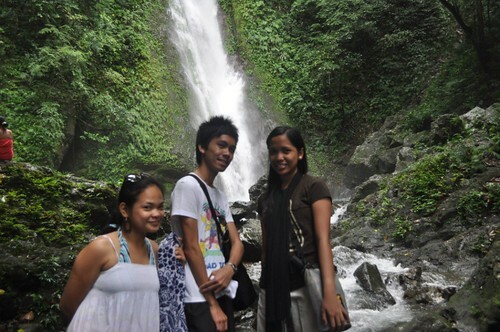 It was a 30 minutes walk before we reached the Kabigan Falls. It was an exhausting trek but everything is worth it. It was indeed enthralling. The water was cold, we planned to swim but I couldn’t manage to take a dip on it. The water was like freezing. Afterwards, we went back and moved on to our next destination. As we moved on to our next stop, we saw the ship that causes the oil spill in Pagudpud. 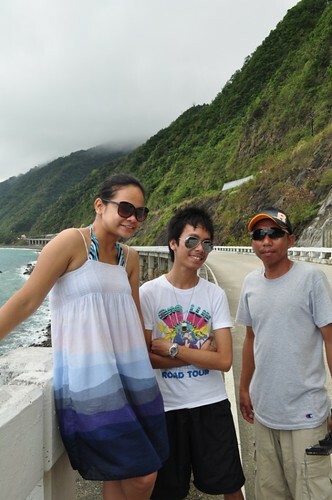 Afterwards, we traveled 5 minutes until we reached the Patapat Viaduct. 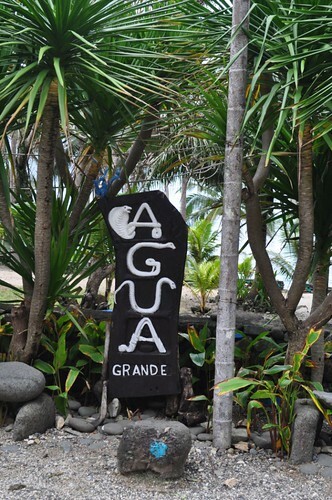 Moving on, we went to Agua Grande. 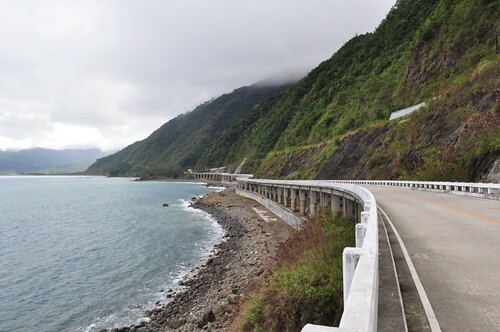 It was just 5 minutes drive from the Patapat Viaduct. There’s an entrance fee if you’re going to take a swim and have picnic at the area. But since, we’re just going to take pictures, Mang Arnel told us that let’s just give donation, so we did. We we’re stunned on how Agua Grande looks like. Another rock attraction. The water is flowing from rocks to rocks. And when I said rocks, as in big rocks! We went down until we reached near the shore. It was a nice view indeed. A calm and peaceful place. Paraiso ni Anton. 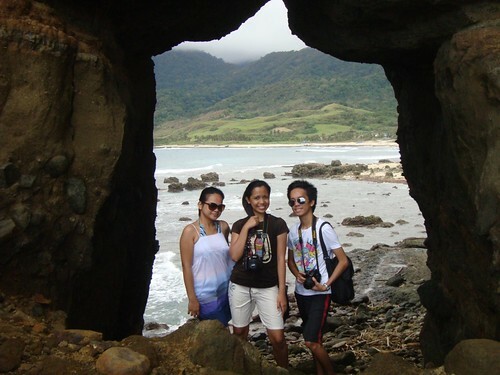 Our next stop, Paraiso ni Anton which is just 5 minutes drive from the Agua Grande. We found nothing impressive on this stop but the cold water and the saint statue. Moving on, we went to Timangtang Rock. 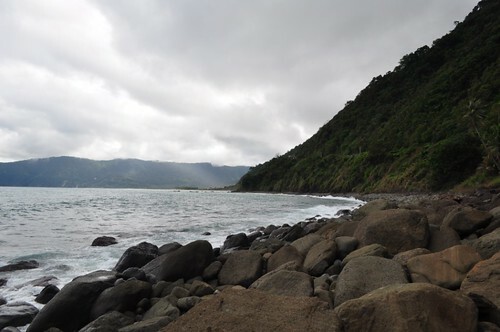 It was just a small rock or hill so nothing attractive to me plus we can smell the oil spill in the sea so we decided to go to our next stop. It was already 12:00 PM when we reached the Bantay Abot Cave, I was already hungry then, and asked Mang Arnel if where can we have our lunch. He told me that there’s a new restaurant along the road and we can have our lunch there after the tour. So I obeyed. The cave is nothing to me at first, it doesn’t look like a cave but just an opening. But behind that, a beautiful view of the sea captured my eye. The wind is blowing, and it feels good. Another sarap mag-emo place. Moving on, it’s time to go to Blue Lagoon! 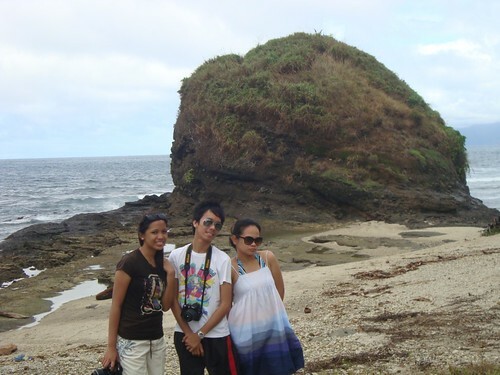 We stopped along the road, and Mang Arnel showed us the Don Hermanos Island from the road, where we stood. The view of Des Hermanos Island is visible from afar. 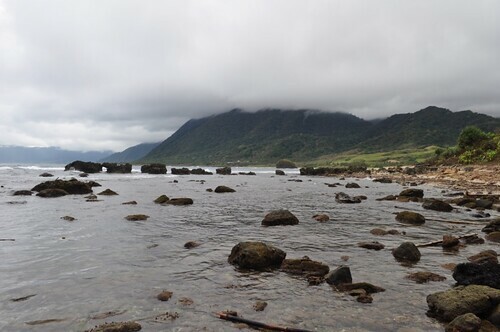 These are two identical mountains lie in Barangay Balaoi. It was already 1:00 PM, I was already famished. 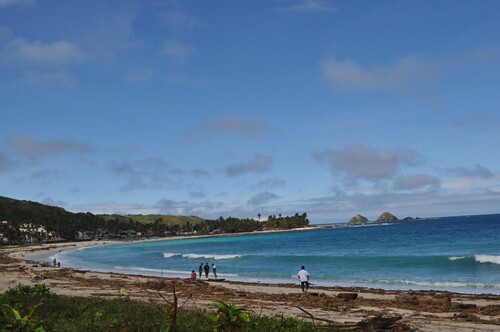 Mang Arnel suggested that there are paluto nearby the beach. We stopped at the paluto area first and selected our choice of paluto. Since fish is the only available dish that day, we asked the lady to cook sinigang for us. 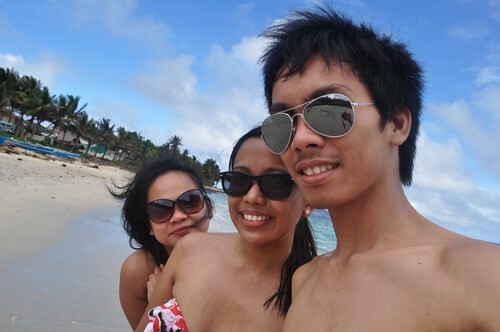 While waiting for our food to be cooked, we went to the Blue Lagoon beach and took a swim first. The weather was fine. The sea was very relaxing. It’s not that wavy compared to Saud Beach. The beach is calm and beautiful. I love the color of the sea. After an hour, we went back to the paluto area. Our food was already served on our table. We ate as if there’s no tomorrow. Lol! 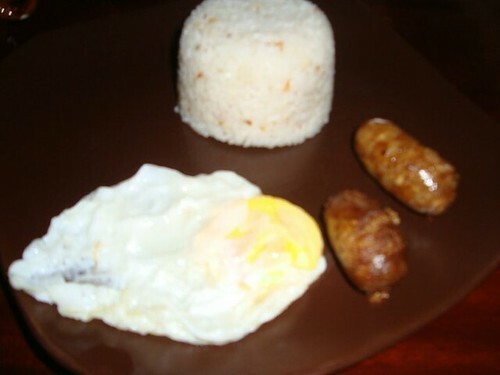 Sobrang gutom. To be fair, the food tasted good. The food, ingredients and paluto cost PHP 400.00 approximately (sorry I forgot the exact price). As soon as we finished our food, I asked Mang Arnel if we can go to Kapuluan Vista just to see how it looks like, so we did. 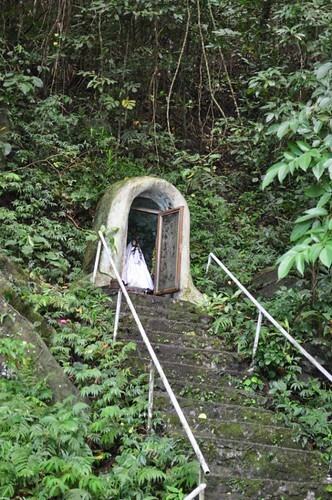 It was located at the end part of the Blue Lagoon, near the Dos Hermanos Island. The shore is rocky so it’s not advisable to swim. Afterwards, it drizzled and so we decided to move on and get back to Polaris Beach House. It was already 3:00 PM when we arrived at our resort. Mang Arnel is such a kind person because he offered himself to take us to the bus station going to Laoag. So I asked Mang Arnel if he can wait for an hour for us to have a bath and fix our things first, and so he did. 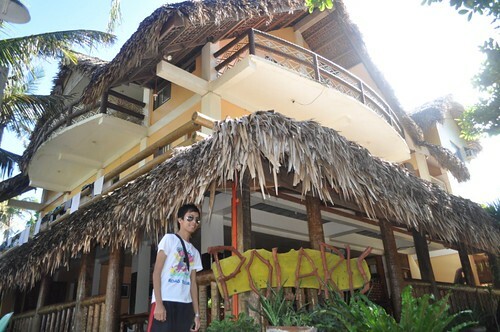 At 4:00 PM, we left the Polaris Beach House. The resort didn’t charge us extra for our excess hours since there are only few guests that day. From the resort, it was a 30 minutes drive until we reached the bus station. We waited for a couple of minutes before a bus to Laoag came. Thanks to Mang Arnel who took care of our tour during our Pagudpud Trip plus he gave us a contact, tricycle driver, who can take us from Laoag to the airport. I was feeling sleepy and tired then, so I just slept during the entire bus trip. At 6:30 PM, we arrived at Laoag. From the bus terminal, we rode a tricycle going to Saramsam Cafe. 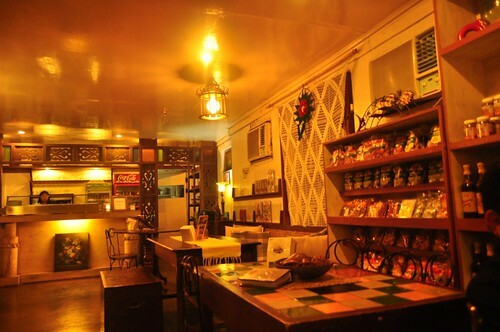 I’ve read good reviews about this restaurant, so I thought of trying it before we leave Laoag. The restaurant is just 10 minutes drive away from the terminal. As soon as we arrived, we took our orders. The menu is interesting. They offer local and traditional dish with a twist. 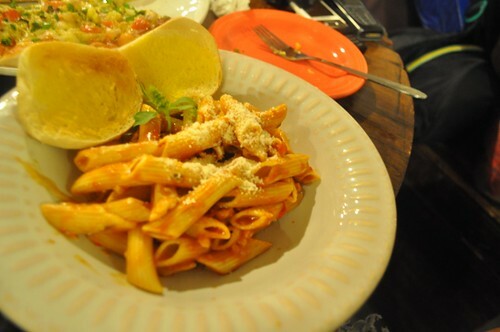 The two pasta dishes were good. It was different and something local that one must try to eat. 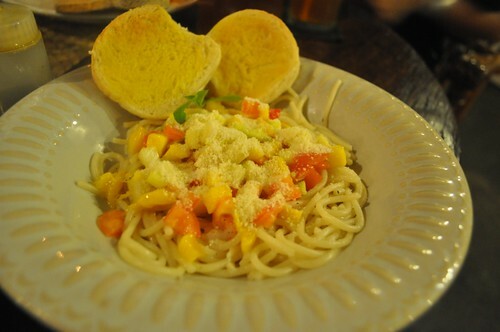 The Saramsam Pasta, my food, is like ensaladang mangga at bagoong with pasta noodles. Sounds weird, but I like how it tasted. It’s spicy (coming from the spicy bagoong) with a taste of green mango and tomato. 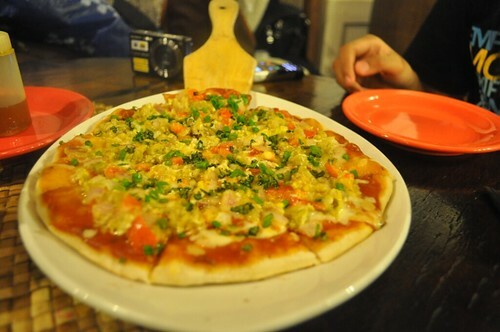 The Poque-poque Pizza is a pizza with local dish as its toppings. 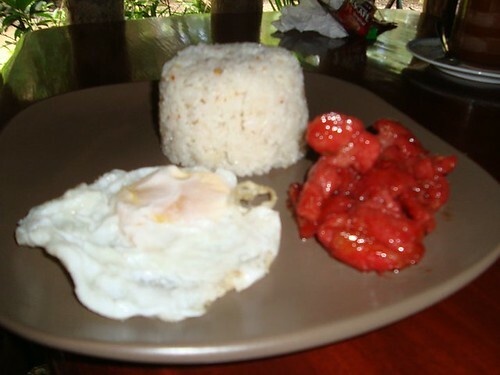 It consist of grilled eggplant, tomatoes, onions and eggs. As soon as we’re done with our foods, I contacted the number (which Mang Arnel gave me) and asked him if he can take us to the airport, and so he agreed. 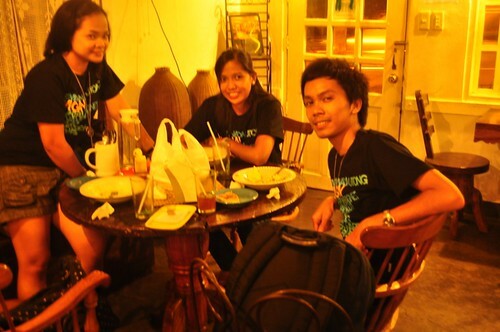 He fetched us at the cafe at 8:00 PM, then took us to the airport. We arrived at the airport at 9:00 PM then checked in. Our flight was delayed for a couple of minutes. And as soon as the gate has been opened, we boarded the plane. We left Laoag at 10.30 PM. Thank you, Ilocos! Try local dish – experience the local taste! Try Paluto at Blue Lagoon. If you want to have a peaceful and relaxing stay in Pagudpud, stay at Blue Lagoon. Just to be safe, the last bus that leaves from Pagudpud going to Laoag is 5:00 PM. But there are also buses coming from Cagayan going to Laoag along the road. 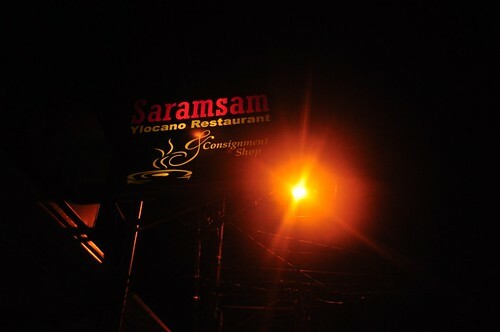 Try Saramsam Cafe at Laoag for dish with a twist.